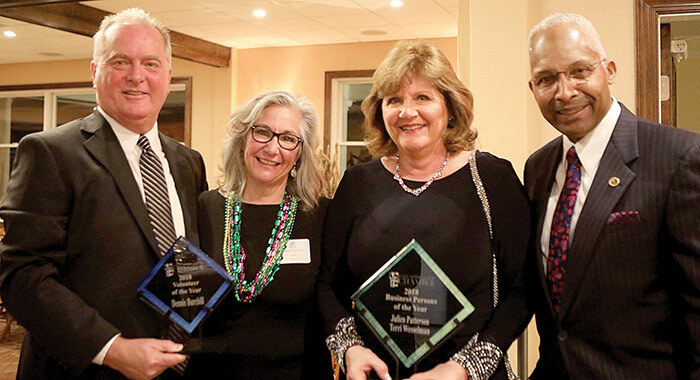 The Lancaster by the Bay Chamber of Commerce on February 2 recognized Terri Wesselman and Julien Patterson as its Business Persons of the Year 2018 and Dennis Burchill as its Volunteer of the Year. They were honored during the Chamber’s annual meeting and dinner at Indian Creek Yacht and Country Club. “Tonight, we have three exemplary examples worthy of being recognized,” said master of ceremonies Jimmie Carter. Wesselman and Patterson are an amazing husband and wife team, said Carter. Some 190 attendees stood and erupted in applause as Wesselman and Patterson came to the podium to accept their award. “We thank you for taking the time to recognize us. We thank the Chamber board, the members of the Chamber and we want to say a special thanks to our many friends and good neighbors who are here tonight,” said Patterson. The Northern Neck is all about our passion, he said. When the duo relocated to the community 20 years ago, they were impressed by the wonderful community, the exceptional people and the vibrant businesses, he said. “It all just served to inspire us and we felt the need to get engaged,” he said. The pair began focusing on things that would create jobs, save buildings and anything that would contribute to the common good for the community, said Patterson.